The Cofrin Library has a trial of the ebrary e-book platform through April 1st. The ebrary database contains full text digitizations of of 1000’s of scholarly e-books. You can browse e-books by topic or search for specific subjects, authors, or titles. ebrary can be accessed through our Databases A-Z list. Downloading ebrary titles requires Adobe Digital Editions, directions for downloading Adobe Digital Editions can be found below. Adobe Digital Editions is a free software that allows you to read ePub files on your computer. Download this free software for offline reading on your computer or device. The Cofrin Library will be updating our guide creation product on Wednesday August 6th. This may result in broken links and error messages when trying to use the library website, especially the database lists and course guides. If you are having trouble finding what you need please contact the library at 920-465-2540 or 1-888-729-4611. For all other questions contact our main desk at 920-465-2540 or 1-888-729-4611. Thank you for your patience while we make improvements to the library resources! The UW Libraries have been really good this year, so Santa is bringing us new servers for Search@UW! We will be migrating to the new servers over the weekend and through Christmas. The My Account and E-Shelf functionality will be in read-only mode (any changes you make will not be saved) starting on Friday, December 20th around midnight, through whenever the work finishes, possibly as late as December 26th. Search@UW will be completely down on Sunday, December 22nd around midnight through 8 a.m.
You will still be able to renew items through the Cofrin Library Catalog link below the search box on our home page, or at the service desks in the library, since the circulation system is not impacted by this maintenance. Please contact us if you need help or have questions! Our new Search@UW tool is experiencing some system issues. We have several teams of people with various areas of expertise working to get the problems resolved as soon as possible. Most of the issues have to do with finding recently added books, DVDs, and course reserves. Articles and e-books are working properly. If you do not find what you’re looking for in Search@UW, you may want to use the Cofrin Library Catalog (now featured more prominently in the green search box on our website), while we get these issues resolved. Power Up @ Cofrin Library! You asked for it and you got it! 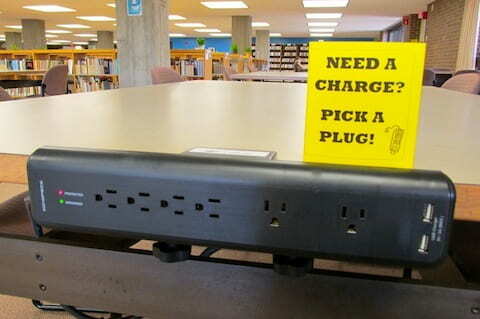 We added power strips to many of the tables on floors 3-6. The power strips have both electrical outlets and USB ports. So charge your phone, laptop, and other devices while you study or hang out! We’ve had reports of some library patrons getting a message in Search@UW that says “User ID not valid. Please refer to Library staff for assistance.” We’ve noticed it usually happens when trying to request something from another library. If this is happening to you, we want to know about it! Please e-mail libraryweb@uwgb.edu, and we will try to figure out what’s going on. In the meantime – if you click on the Community Users link instead of the UWGB Students and Staff one, that login will accept the 16-digit barcode on your student ID and your last name, and you will be able to complete your request. 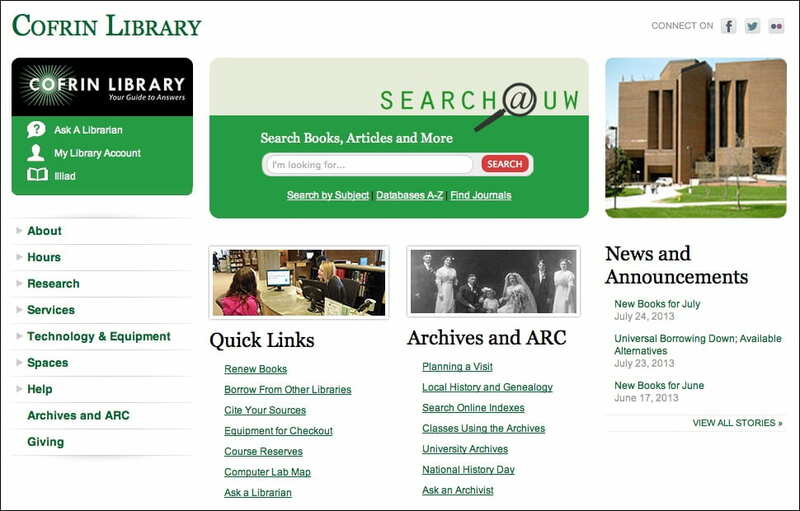 Search@UW is a new search tool that is the focus of our new library website! Articles from most of the library’s databases, and much more. Need more info? Check out our Search@UW Guide. Let us know if you have any questions! Cofrin Library will be unveiling a new website and search tool this month! A major component of the new website will be Search@UW: a new research tool that combines searching for articles, books, and more into one single search! It will also integrate the powerful resources available to you from the UW System into one common search interface. Watch for more announcements later this month. 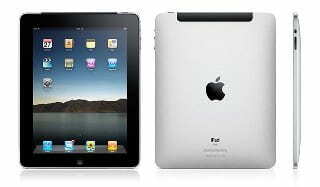 Last month, we told you about the new iPads available for check out from Cofrin Library. Now we have updated the iPads with even more apps. The library iPads are available for check out from the 3rd floor Circulation Desk on a first come, first serve basis for a 7-day loan period. The following is a list of installed apps and features. ABC Player – Watch ABC shows like Modern Family, Grey’s Anatomy, Castle, etc. HuluPlus – Watch programs on Hulu. User needs a Hulu subscription. NBC – Watch NBC shows like The Office, 30 Rock, etc. Netflix – Watch streaming movies & TV shows. User needs a Netflix subscription. IMDB – Look-up movie/TV info, actors, etc. Pandora – Streaming music. User needs to sign in or create free account. Shazam – Hear a song you don’t know? Shazam identifies it instantly. New York Times – Access to “Top News” section. User needs subscription for other content. Dragon Dictation – Speak into the mic and have your words transcribed into text. Evernote – Note-taking device, create voice reminder, etc. UPDATE: as of 10pm on March 27, 2012, the EBSCO databases are working again. If you have questions, call the Library at 920-465-2540, or chat with us online.